When you bake you want to have a leavening effect in the dough, i.e. somehow incorporate gas bubbles in the dough or batter to make the final product lighter and softer. How is this achieved? The most traditional method – and certainly still the best if you want to bake quality bread – is using sourdough. 19th century bakers also used brewers yeast and it was only in the early 20th century that commercial baker’s yeast as we know it became available. Sourdough and yeast are biological methods of leavening the dough by fermenting sugars in the dough into carbon dioxide (CO2) and ethanol. On the other hand soda and baking powder are chemical leavening agents. The purpose is to create CO2 gas and steam (water) in the dough in an easily manageable way. Soda and baking powder are used in quick breads and cakes, as well as cookies and numerous other applications where a biological fermentation is impractical or undesirable. Used as a leavening agent, baking powder lightens texture and increases the volume of baked goods such as muffins, cakes, pancakes, and cookies. Baking powders were used already in the mid 19th century and became widespread in the early 20th century. It is interesting to realize that baking powder was commercialized earlier than baker’s yeast. Baking powder is a dry leavening agent, a mixture of a weak alkali and a weak acid and a bulking agent (starch). Baking powder works by releasing carbon dioxide gas into a batter or dough through an acid-base reaction, causing bubbles in the wet mixture to expand and thus leavening the mixture. The alkaline component is baking soda (sodium bicarbonate). The acid can be either fast-acting (reacts in room temperatures) or slow-acting (reacts in high temperatures, i.e. in the oven) while baking powders containing both are called double-acting. However the slow-acting acids are not allowed in organic products* so only fast-acting acids can be used in organic baking powder. Typical fast acting acids are Calcium Acid Phosphate (also called Mono Calcium Phosphate) and cream of tartar (potassium hydrogen tartrate). The Aloja Organic Baking Powder contains Calcium Acid Phosphate. Slow acting acid salts include sodium aluminium sulphate, sodium aluminium phosphate and sodium acid pyrophosphate (these are not allowed in organic products). where CO2 (carbon dioxide), water (steam) and salts are the result of the acid-base reaction. If the dough contains acidic ingredients it is not necessary to use baking powder as baking soda will react with the acids in the dough. To absorb moisture. This is important for preventing the components from reacting with each other prematurely and thereby for the shelf life of the baking powder. For better and more even mixing and more accurate measurement. potato starch is 100% GMO-free. Potato starch starts to swell at less than 60 degrees Celsius and reaches maximum at 80 Celsius. After this point the starch granules start to break and form a gel. In a baking process this increases the leavening effect of Baking Powder by forming a protective film inside the gas bubbles thereby preventing the gas from escaping and the dough from falling. By comparison corn starch does not have a similar effect as it starts to swell at much higher temperatures and won’t function in baking temperatures. Similarly a protective film is formed on the surface of the baked product. The result is a more crispy product and reduced moisture migration. For example cookies stay crispy for a longer time. This effect – if desirable – can be enhanced by adding more potato starch than what is already in the Aloja Baking Powder. The main difference between potato starch and corn starch – or any other starch for that matter – is the lower swelling temperature of potato starch. This is also the key issue why potato starch is better than corn starch as a carrier in Baking Powder. Actually we can say that Aloja Starkelsen has created a Double Function Baking Powder by using potato starch. 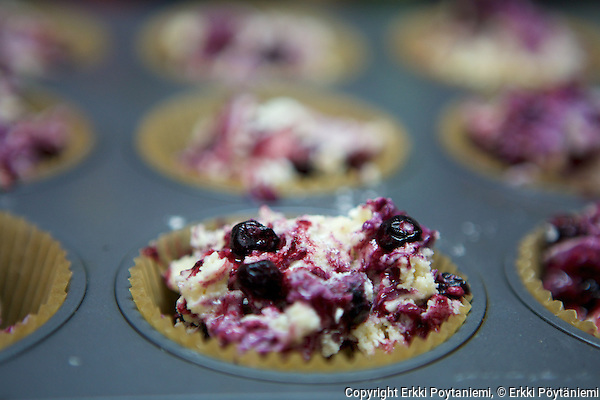 Organic Blueberry Muffins (including Organic Baking Powder) on their way into the oven…. Potato starch is clean with no known allergy issues and it is gluten-free. There are no GMO potatoes grown in Europe which eliminated any risk of GMO contamination. … and after 35 minutes in the over. Baking powder is not your typical organic product as it is not food as such. However over half of baking powder is actually starch – which in an organic product must be organic – while the other half are the soda and acid. We offer baking powder as bulk to organic manufacturers and as a consumer packed product. A manufacturer of baked products in which baking powder is used has two choices: to buy organic baking powder or to buy the components of baking powder separately and blend them on-site. For a small and mid-size operator it is more efficient to buy an accurately blended baking powder from a professional manufacturer. Inaccurate blending can result in residues and off-flavor in the final product. For a consumer blending is not an option. Most Baking Powders that are available in supermarkets contain corn starch which cannot be guaranteed to be Gmo-free and don’t offer the same functionality as potato starch. Double acting baking powders can contain aluminium. However the Aloja Organic Baking Powder is thanks to potato starch double functioning and it is a certified organic product. 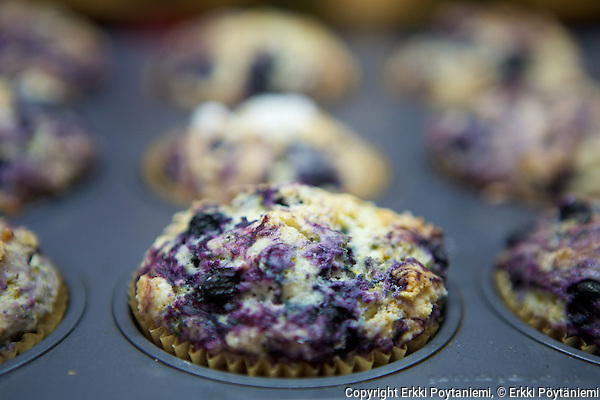 Baking powder is used in bakeries in muffins, cakes, cookies, biscuits and fast breads. It can also be used in deep frying to create crispy coatings or in fried sweets. The dosage is the same as for conventional baking powder: 1 teaspoon of baking powder for 1 cup of flour or approximately 2% of the flour. Be sure to be back to the Organicpotatostarch.com blog for a later posting about Baking powder applications! Due to the equivalency agreement between the EU and the USA all organic products (with a few exceptions) that are certified organic according to EU regulation 834/2007 in a EU member state and shipped to the USA or Canada can be sold and labeled as organic in those countries. USDA: Importing organic products from the European Union. For further information, application support, samples and offers, please feel free to contact us for any further information. * Only substances allowed in COMMISSION REGULATION (EC) No 889/2008 Annex VIII can be used.